Satyagraha is composer Philip Glass’s meditation on Gandhi’s early years in South Africa, tracing the progress of his concept of non-violent protest as a positive force for change. First staged in 2007, Phelim McDermott’s highly acclaimed, spectacularly theatrical production is a visual feast. Glass’s use of repetitive musical structures – ‘minimalism’– creates a mesmerising soundscape, quite unlike traditional operas. Following the Olivier Award-winning run of Akhnaten in 2016, McDermott is reunited with Glass-specialist conductor Karen Kamensek. Distinguished British tenor Toby Spence sings Gandhi for the first time, and is joined by sopranos Charlotte Beament (Miss Schelesen) and Anna-Clare Monk (Mrs Naidoo). The home of ENO is the London Coliseum in the heart of London’s West End. Conveniently positioned in Theatreland, the theatre is near both Trafalgar Square and Leicester Square and benefits from the proximity of a number of tube stations and Charing Cross national rail station. With the widest stage in London, it is a perfect venue for dance and performing arts companies. The glorious Edwardian architecture and interiors were magnificently restored in 2004, providing a beautiful auditorium and wonderful entertaining spaces throughout the building. The London Coliseum was designed by Frank Matcham for Sir Oswald Stoll with the ambition of being the largest and finest ‘People’s palace of entertainment’ of the age. Matcham wanted a Theatre of Variety – not a music hall but equally not highbrow entertainment. The resulting programme was a mix of music hall and variety theatre, with one act - a full scale revolving chariot race - requiring the stage to revolve. The theatre’s original slogan was PRO BONO PUBLICO (For the public good). It was opened in 1904 and the inaugural performance was a variety bill on 24 December that year. With 2,359 seats it is the largest theatre in London. It underwent extensive renovations between 2000 and 2004 when an original staircase planned by Frank Matcham was finally put in to his specifications.The theatre changed its name from the London Coliseum to the Coliseum Theatre between 1931 and 1968. During the Second World War, the Coliseum served as a canteen for Air Raid Patrol workers, and Winston Churchill gave a speech from the stage. After 1945 it was mainly used for American musicals before becoming in 1961 a cinema for seven years. In 1968 it reopened as The London Coliseum, home of Sadler’s Wells Opera. In 1974 Sadler’s Wells became English National Opera and the Company bought the freehold of the building for £12.8 million in 1992. The theatre underwent a complete and detailed restoration from 2000 which was supported by National Heritage Lottery Fund, English Heritage, The National Lottery through Arts Council England, Vernon & Hazel Ellis and a number of generous trust and individual donors to whom we are extremely grateful.The auditorium and other public areas were returned to their original Edwardian decoration and new public spaces were created. The theatre re-opened in 2004. 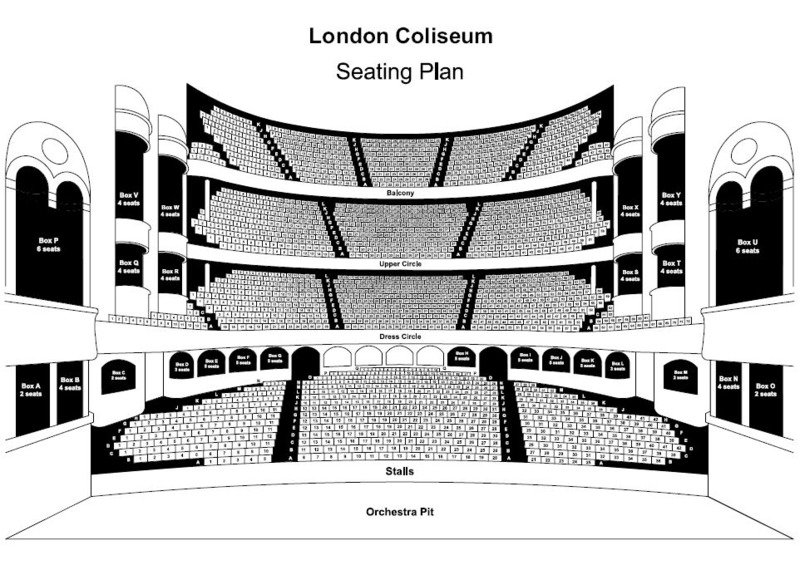 The London Coliseum has the widest proscenium arch in London (55 feet wide and 34 feet high – the stage is 80 feet wide, with a throw of over 115 feet from the stage to the back of the balcony) and was one of the first theatres to have electric lighting. It was built with a revolving stage although this was rarely used which consisted of three concentric rings and was 75 feet cross in total and cost Stoll £70,000. A range of modern features included electric lifts for patrons, a roof garden and an Information Bureau in which physicians or others expecting urgent telephone calls or telegrams could leave their seat numbers and be immediately informed if required.